Jon Bernthal en xullo de 2017. 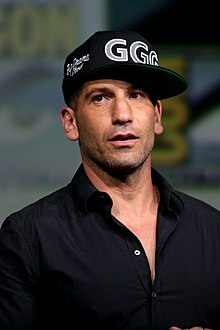 Jonathan Edward "Jon" Bernthal, nado o 20 de setembro de 1976 en Washington, D.C., é un actor estadounidense de cinema e televisión. 2002 Law & Order: Criminal Intent Lane Ruddock Episodio: "Malignant"
2004 Without a Trace Alex Genya Episodio: "Bait"
2004 Dr. Vegas Greg Episodio: "Dead Man, Live Bet"
2004 Boston Legal Michael Shea Episodio: "Questionable Characters"
2005 Jonny Zero Brett Parish Episodio: "I Did it All for the Nooky"
2005 Law & Order: Special Victims Unit Sherm Hempell Episodio: "Goliath"
2005 How I Met Your Mother Carlos Episodio: "Purple Giraffe"
2010 Numb3rs Mike Nash Episodio: "Growin' Up"
2012 Harry's Law Lucas Trassino Episodio: "The Whole Truth"
Jon Bernthal na IMDb (en inglés).